No matter what "legal experts" and other corporate pundits may claim regarding the narrow grounds specified in the June 2018 Supreme Court ruling, Masterpiece Cakeshop v. Colorado Civil Rights Commission—that a Denver baker could refuse to make a wedding cake for two men—the fact is that the court opened the door for legalizing discrimination based on religious beliefs, despite the fact that, according to the Constitution, religious beliefs cannot override the law. Yes, the law cannot specifically discriminate against a specific religion, but it also cannot favor a specific religion, as the verdict did. Additionally, it can be said that anyone justifying their bigotry based on "Christianity" is certainly not following the teachings of Jesus. Lawless governance and hijacked teachings aside, the original discriminatory event created a divisive debate between those who support LGBT rights and those who would like to pretend that Jesus would support discrimination against anyone because of their genetic, emotional, and/or spiritual makeup. Before the Roman Empire and its successors usurped and edited Christianity to poison the hearts and minds of indigenous peoples around the world as a means of control, there was widespread recognition among natives for the rights of individuals across the entire sexual spectrum. In an attempt to go beyond the animus expressed by both sides in the legal case as well as those reacting to it, playwright Bekah Brunstetter reconceives the story around a lesbian couple from Brooklyn who decide to get married in a small town in North Carolina, where one of them, Jen (Alaina Beth Reel), was raised among Christian fundamentalists. Jen's significant other, Macy (Jada Suzanne Dixon) is African-American. They visit a bake shop run by Della (Emma Messenger), an old friend of Jen and her family. This scene is masterfully constructed by Brunstetter, and sets up the emotional arcs of all three women. Della is so excited to hear about Jen's upcoming wedding, and Jen is hesitant to tell her that Macy is the other bride. Macy becomes impatient at Jen's reticence, begging the question. Della is obviously taken aback, but remains genteel, although she says that her religion prevents her from making the pair a cake. Messenger's transparent and translucent naturalism illuminate Della's emotional currents: she loves Jen, but feels conflicted because of her longstanding "Christian" belief system, which is inculcated on a daily basis by her surroundings. 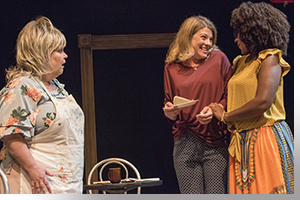 The personal nature of this story allows the playwright to deliver a catharsis where the impersonal nature of the event and legal case continues to bring divisiveness. Jen and Macy have conflicts of their own: Jen lives between two worlds—how she was brought up versus her true nature; Macy is a journalist who is brutally honest, which has a major effect on Jen's friend Della. Macy also grows impatient with Jen's attachment to the dysfunctional world of her youth. Jen reaches a turning point when she explains to Della how she came to understand her own sexuality. 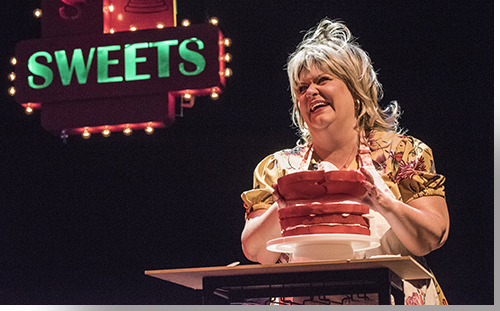 Reel's monologue here packs a wallop, the results of which we see in Della's change of heart, which comes along with realizations concerning her own marriage to Tim, a hilarious Michael Morgan, as a socially inept plumber. While Macy is a driving force in both Jen's and Della's changes, she, too, is transformed, by Della's change of heart. Dixon's deft removal of Macy's armor, and her heartwarming apology and good-natured concession to Della's baking talents, bring the story to a enlightened ending, and show the wisdom in Brunstetter's choices when adapting the original story. Director Chip Walton keeps the pace brisk, and while the script pushes the boundaries of a one-act, at 107 minutes, we agree that uninterrupted momentum is important here. Excellent craft work from the company's design team. 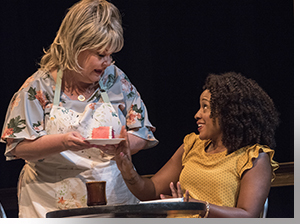 Curious Theatre Company's regional premiere of The Cake runs through October 13th. For tickets: https://www.curioustheatre.org.